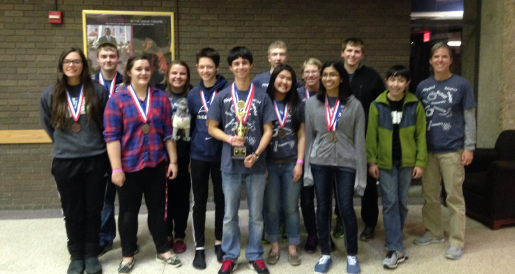 On Saturday, April 11, 16 Upper School students participated in 23 events at this year’s Wisconsin Science Olympiad competition hosted at UW-Milwaukee. With over 43 students participating this year, Prairie’s team of juniors and seniors came back victorious with a first and second place individual state medal, and an overall 6th place team win in the State of Wisconsin! “I am thrilled that we are the 6th best team in the state. The best part for me is that our trophy represents the hard work of the entire team, not just those who won medals in their own events. Prairie’s Science Olympiad team is well-respected across the state and into Illinois,” shares Jean Weaver, Upper School Science Chair & Science Olympiad Coach. 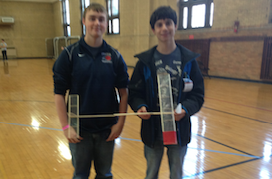 Seniors Erik Wirtz and Jonathan Becker secured a first place medal in the Wright Stuff event where students were tasked with designing, constructing and testing a rubber band-powered plane with the goal of maximizing air time. With a total flight time of 2 minutes and 42 seconds, the boys created an airplane that guaranteed them a first place win. Other medal awardees include Dhanya Attipetty and Rachel Brown who took second in Invasives; Ellie Plachinski and Sapan Shah taking 4th in Compound Machines; Maria Hatem and JohnMark Goeke who took 5th in Food Science; and Laia Aguilar and Dhanya Attipetty who took 5th in Entomology. A team’s final score is based on its cumulative rankings in 23 events. Prairie medaled in six of the events and placed in the top 10 in well over half of the events. Overall, Prairie took 6th place in Wisconsin’s State Competition. For over 31 years, Science Olympiad has grown to be one of the premiere science competitions in the nation. Prairie’s Upper School has competed for the last 10 years and popularity is at an all-time high. In fact, over 40 Prairie students participated in Science Olympiad this year, the same level of participation as that of schools with thousands of students. State, regional and invitational competitions draw schools with enrollment ranging from a few hundred to over 4,000 students. Prairie is one of the smallest and one of only a few independent schools that regularly attends. For students who have a passion for science, technology, engineering, and mathematics (STEM), Science Olympiad provides an opportunity to pursue additional topics that are not part of a high school’s normal curriculum. Science Olympiad also provides a competitive venue for academic achievement and inspires those with a competitive spirit to learn the most in their chosen events. Congratulations to all participants this season! This entry was posted in All News, Featured, Learn More About Prairie, Upper School by Communications Department. Bookmark the permalink.